Repairing a metal roof is quite often more difficult than installing a new roof on a new dwelling. Repairing a roof presents a lot more challenges such as sagging roof structures, rotten fascia’s and barge boards as well as dried out battens just to name a few. Many of the problems encounter during a roof repair are not noticeable to the eye when looking at the roof from ground level but present themselves during the inspection phase often turning the repair job into a job that is bigger than the owner expected. With a roof replacement, many of these problems become just a part of the new roof as they are generally part of the new roof process anyway. Therefore you do not have to have your old roof removed, the problem fixed then your old roof replaced. People have often installed a multitude of accessories to their roof during its lifetime. Things like pool heating, skylights, whirly birds, Air-conditioning units, antennas, solar panels, the list goes on and on and are all installed on the roof. These items either have to be removed and reinstated or discarded if not still in use whilst fixing or replacing your roof. When deciding whether to replace or fix your roof it should be considered if the added cost of the repair in removing then replacing these items back onto an old roof is a wise investment as the roof may well fail again in the next couple of years or even months. What happens to your beautiful garden while we are repairing our roof? Established landscaping around your home is another consideration when choosing the roofing company you wish to work with. Here at Sydney Roof, we understand the time and money that has gone into your gardens and take extra care when replacing your roof not to damage this precious investment that you have made in your home. At Sydney Roof, we have expertise in all aspects of both roof repair and replacement and can give you an honest and explainable quote based on many years of experience with dealing with anything a roof can throw at us. There is nothing your roof can have wrong that we have not dealt with on many occasions. Installing a new roof is a great look if you are renovating or modernising or just upgrading your tired old roof. It can also be far more financially viable in the long run compared with continuously repairing an old roof. The warranty on a new roof will leave you feeling worry free for many years to come not having to be concerned every time it rains or there is a storm coming. Sydney Roof also deal with commercial roofing. Sydney Roof has the expertise and manpower to tackle large scale commercial works. We take the time to consult with the property owner to fit into your timescale and to repair or replace your roof with the least disruption possible to you and your workplace. Ah, the joys of home owning… sitting back on your very own patio and enjoying a glass of wine, thinking about the equity that’s growing under your feet day by day… sounds like a dream come true, right? Well, that’s not always the case. The fact of the matter is, owning a home comes with a lot of responsibility. In order to keep your investment in tip-top shape and ensure the health of not only your home’s physical structure but its financial value, a responsible homeowner will find there’s often a lot of maintenance that comes with a home purchase. Those who buy brand new homes or build from the ground up will find themselves facing a host of decisions different to those who buy an established property. In the Sydney property market, in particular, there are many beautiful homes that have been built many decades ago, and offer their own unique appeal to someone who’s looking for a sense of history in their home purchase. However, buying a home that’s been built a long time ago means the costs of maintenance can rise in comparison to building something afresh. One of the largest costs a homeowner can expect to potentially face across the course of their home-owning life is that of roof replacement. Experts can agree that the majority of roofs have a lifespan of between 20 and 25 years. If you’ve happily bought yourself a property built in the 1970s, 1980s or even the 1990s, it may be time to look at the health of your roof and make the hard but wise decision to invest in a new roof. Although it may hurt the hip pocket at the time, it’s a decision that will have great financial pay-off over the decades to come, as a fresh roof can save your home from a myriad of further issues that can occur if a roof has damage that isn’t properly addressed. The age of the roof – how long has your current roof been working to protect your home day in and day out? Keeping in mind that the average roof’s lifespan is somewhere around 20 years, this may be an easy way to make a decision about a roof replacement vs. a roof repair investment. If there has been another roof replacement during this time, but it was installed over an old layer rather than replaced entirely afresh, this may also impact on the need for a new roof, as proper ventilation may not have been in place. Curled or buckling shingles – If your roof is made up of shingles, they can provide telltale signs that it’s time for a replacement. If they’re curled, or are buckling in certain areas, this is a sign of damage that is best addressed with a full replacement. To check on this, find the part of your roof that receives the most direct sunlight over the course of the day and check on the state of the shingles in that spot. If they’re curling, or have lost some of their granules, they’ve reached the end of the road, and it’s time to invest in that replacement. Roof valleys – if there’s one key area of your roof where shingles are missing or have begun to fall apart, this is a clear sign that it’s time for you to make the decision to replace the roof altogether. Valleys are a crucial part of your roof as this is where rain flows down into your gutters. If these valleys are not structurally sound and protected due to missing or defective shingles, you’re leaving yourself exposed to leaks, which can lead to deep structural damage in your home that will cost more in the end to fix due to the damage caused. Flashing around your chimney – If you have flashing that is made up of cement or tar, you may require a roof replacement with a material that’s going to last better in the long-term, such as metal. Shingle granules resting in the gutters – As roofs reach the end of their life spans; they begin to lose granules at a faster rate than they did at the beginning. If there’s a large amount of shingle granules in your gutters, this is a sure sign that your roof is reaching the end of its life cycle. As well, if there’s a darker color on certain areas of your roof, this is another sign that it’s almost the end, as this shows where granules have worn away over time and left the roof in a weakened state. Sunshine coming in through the roof boards – if you’ve been walking around on your roof to check its health and have felt a spongy feeling underfoot, this could be a sign that the decking which lies underneath your roof surface has been weakened as a result of moisture pooling and causing deterioration. To confirm your suspicions, check either your attic or the area of your house that portion of the roof resides over for sunlight coming through any of the roof boards. If you can see sunlight coming through, this is a very obvious sign that your roof’s structure has been weakened and compromised. It’s also pretty lucky that you’ve caught it at this stage – with holes like this occurring, it may not be long before certain parts of your roof collapse if a particularly bad storm rolls through, as it’s in a highly weakened state and will not be able to withstand heavy rain for much longer. 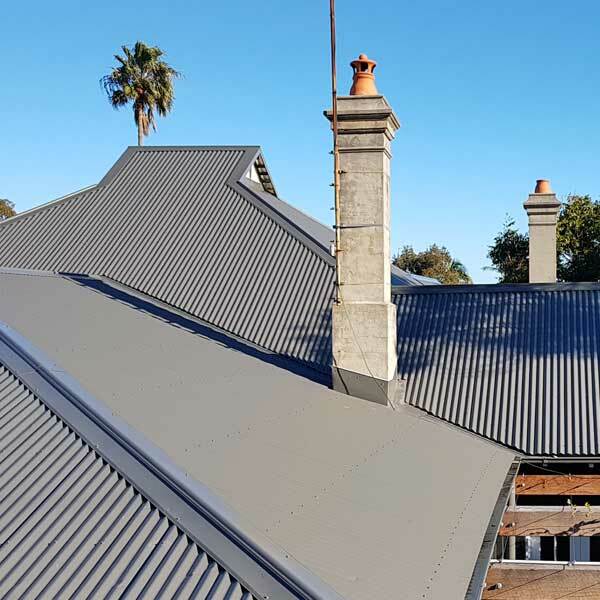 Long lasting paint – as the colour is bonded directly to the steel metal, it won’t require painting as often as other roofing materials, meaning your upfront investment will last for many more years. If installed properly, a Colourbond roof can also save you money over time on your heating and cooling costs, as it is better at adapting to various weather patterns and temperatures than other roofing materials. Colourbond roofs require less maintenance than other roof types, so it’s a wise move to do your research to see if this kind of roof is the best kind when looking for a replacement for your old roof. Terracotta tile roofs – this is a natural clay product that has been used throughout architecture across the ages. These are a very popular tile type for Australian roofs; however, they do prove more costly than their concrete tile relatives. Terracotta tiles offer many options when it comes to their colouring and profiles, and are a strong choice as far as your roof type when it comes to their energy efficiency. Because they’re so naturally dense, they’re good at evening out temperature fluctuations that can occur across a 24 hour period as temperatures change. Another popular tile choice is the concrete tile. These are a wonderfully durable option and have been proven to last up to 50 years – if you’re considering a roof replacement, that’s an attractive lifespan for your dollar! Concrete tiles are effective at reducing energy consumption within the home through their ability to control the internal temperature. The one element to keep an eye on if choosing a concrete tool for your new roof is its porous nature – paint does not infiltrate as deeply on a concrete tile as it does with a terracotta tile, and you may require a fresh paint job every few years in order to keep your roof looking brand new. When making a decision about the type of material to use for your new roof, it’s important to consider your aesthetic preferences, ability to maintain the needs of the various roof types, and the climate you live in as to what will prove the best choice over time. Speaking to your roof replacement contractor about the options available allows them to add their professional opinion to the mix which could end up saving you time and money over the years your new roof will be in place. Pricing – it’s a mistake to choose your roof replacement professional solely on price alone. In order to offer the lowest price on the market and undercut their competitors, a contractor may hire workers who are working at a low-wage rate in order to achieve these prices. However, you’ll see the result of these less experienced and cheaper workers in the final product. To avoid this, arm yourself with a range of quotes so you can understand what is a high, medium and low bid for the work required. Discuss these quotes with each contractor to understand which portion is assigned to labour and which portion is assigned to materials. Method – it is possible to install a new roof layer on top of an existing, and this is a method that will save you both money and collateral mess, as the old roof will not need to be entirely removed. However, there is a downside to this approach, as the roof replacement contractor will not be able to examine the decking of the roof itself to understand its condition. This means structural issues could remain in place under the disguise of a new roof. Discuss this with your roof replacement contractor to understand the best approach for your particular roof and its current condition, so you can be assured the process will be carried out in a way that will guarantee the best results. Check the paperwork – given the high risk of working at heights with building material, roofing is a process that requires liability to be in place for each worker undertaking those activities. You may also require a building permit from your local council or estate to ensure your new roof will fit within the building code and you won’t fall afoul of any building laws you were not aware of. As well, it’s best to have a full written contract in place with your roof replacement contractor before work begins, so you’re aware of the products being used and the range of costs, preventing you from bill shock at the end of the task. Lastly, you will require your contractor’s insurer to provide you will a letter that confirms the work undertaken on your property is covered under the roof replacement contractor’s liability. This gives you full peace of mind and means you’re legally covered before this work takes place. Once you’ve made these crucial decisions and your new roof is installed, now’s the time to revert to that homeowner’s dream – sit back and relax with a glass of wine under your freshly finished roof, and relish the knowledge that you’ve just secured its safety for years to come. Job well done!